 Inspire Suffolk hosted its first ever awards ceremony- shining a light on the successes of our students and staff, on Tuesday March 27. The event celebrated the dedication of our young people, volunteers and staff and the important work that our charity undertakes. We would like to thank all of the businesses, supporters and everyone involved in making the evening such a success and allowing us to celebrate our young people and staff. Thank you to all of our award sponsors listed below, as well as Fashion Candy Style and M&S Ipswich for sponsoring our welcome drinks and refreshments. Your support means so much to us! This award recognises the positive progression route sustained by our young people since leaving Inspire Suffolk. Our nominees have acted as role models and have had a positive influence on others. The Outstanding Achievement Award went to Jess Athorn. We met Jessica in 2013 when her confidence had been hit and she felt like there was no hope. 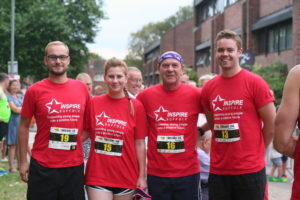 She joined Inspire Suffolk’s Princes Trust Team programme and began re-igniting her passion for sports and fitness and completed a work placement at a local gym. The management were so impressed that they offered her a position as an Apprentice Gym Instructor. 5 years on, Jessica is now a fully qualified Gym Instructor. She enjoys being able to provide motivation to others that they can achieve their potential, just like she did with Inspire Suffolk. Congratulations to Jack Pope and Ryan Taylor for being recognised for this award. This award recognises the exceptional community engagement and contribution that our young people make to their local communities, whilst developing their own key skills. The Stowmarket Team scooped the Community engagement award for transforming the garden area of the Leading Lives Stowmarket Community Hub, a local charity’s centre which supports adults with learning difficulties. Our young people worked hard alongside the service users of the centre, by clearing and weeding the overgrown garden area, refurbing and painting the benches in the area, and planting new plants. This now benefits users of the centre who enjoy it for downtime and activities. Well done to our Lowestoft Team who created a nature trail at Pathways Care Farm and our Leiston Team who enhanced the gardens of Aldringham Court Nursing Home in Leiston to benefit the residents. 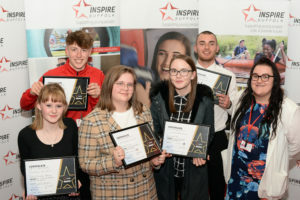 This award recognises the hard work and dedication of our Inspire Suffolk apprentices, who have demonstrated a strong work ethic and dedication to achieving their potential. The apprentice of the year award went to Niall Woods who came through our Prince’s Trust Team programme and overcome the issues he faced and is now working as an apprentice sports coach at Inspire Suffolk. He has gone beyond his role by supporting our facilities team, as well as supporting residential trips, to support the wider charity team. Niall always conducts himself in a professional manner and is always keen to take on extra work while continuing to get on with his own academic work and excelling in the quality of it. This award recognises the commitment and determination that our young people have shown in overcoming their individual challenges. The positive influence that they have had on others should not be underestimated. Jodie Hinks received the Inspirational Young Person Award, having led her Inspire Suffolk group on their community project at a centre supporting adults with learning disabilities. Before Jodie joined Inspire Suffolk, she had left her job to care for her mum and for herself, which she focussed all of her energy and time on. She decided it was the time to put some focus on herself and pursue her career route. She was the only female in a predominantly male group, but this didn’t stop her. A natural leader appeared and she led the group on their community project at a centre supporting adults with learning disabilities. 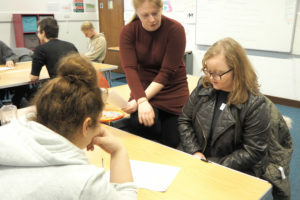 Jodie had a job interview following her amazing work on their community project and got the job. This was an exceptional achievement and did herself really proud. Well done to Aaron Fendley and to Sam Powell for being shortlisted for this award. This award recognises outstanding achievement by the individual, both in terms of gaining their qualification and reaching their desired outcome. Sam Powell earned the Young person of the year award having joined the charity after becoming homeless due to rent arrears. He joined our Prince’s Trust Team programme initially to have something to keep him off the streets whilst he was homeless, but quickly realised that he wanted to stick at it to build his skills and get onto a secure path in his life. He found a secure place to live at Christchurch House and gained a full-time job for a new trampoline park in Ipswich. He plans to build his career in coaching and has aims to move out of his supported housing into his own flat in the near future. Well done to Anthony Brame and Danielle Fulcher who were shortlisted for this award. Your stories are an inspiration and show such progression!  This award recognises the commitment to sport at Inspire Suffolk and those who have had a significant impact on others in the sporting environment. This award went to Liam King who joined our Adult Disability sessions last year. He has shown drive and commitment to push himself that little bit harder each time to keep up with the older, more experienced players. He has become a key member of the group and recently competed for Inspire Suffolk in football festivals against other teams. He even captained the team where they won the game and went on to win the league! He has shown many youngsters that age is just a number and you can do what you put your heart and mind to it. Well done to Ed Martin and Oscar Watson who also received special commendations for this award and their commitment to sport at Inspire Suffolk. This award recognises a significant progress by the individual since joining the charity. Our nominees have been a positive influence on others and have added real value to the organisation. The Rising Star award went to Paul Partington who progressed from an assistant team leader to the charity’s post-16 education coordinator, managing the delivery of Inspire Suffolk’s education programmes. Paul’s progression is a testament to his hard work, determination, and commitment to the charity. He always goes above and beyond with his fantastic work ethic, always makes himself available to talk through any problem, no matter how busy he is, and you can rely on him to get the job done. Under pressure, which is frequent in our line of work, Paul picks up his game and continues to thrive— supporting others and progressing our aims forward, always with a smile on his face. Congratulations to Jacob Charles and Niall Woods for being recognised for this award. This award recognises the outstanding achievements of our staff here at Inspire Suffolk. Our nominees have delivered excellence over and above, throughout the year. The sports coaching team took away with the Inspire Suffolk Team of the year award. It delivers top-class sports sessions, giving as many young people as possible the chance to play sport, build confidence and learn new skills. They deliver a range of energetic sports session in school, free turn up and play sports sessions, and holiday camps throughout the year. They have taken many obstacles in their stride this year, picking up extra responsibilities when needed, putting their hand up when sessions need to be covered and exceeding expectations with holiday club targets which many thought were out of reach. Well done to our Facilities and Team programme Teams for also being recognised. The hard work and dedication of our staff are vital to being able to make such a difference to the lives of local young people. This award recognises the aspirational role models within our charity. Those nominated inspire children, young people and their peers with their consistent professionalism. Stacey Foulger won the Excellence in Teaching or Coaching award. Stacey has been with Inspire Suffolk from the very beginning and is currently delivering her 21st Prince’s Trust programme for the charity. Delivering over 20 Team programmes is a true testament of her ability in teaching and helping to improve the lives of so many young people who need our support. She was nominated for her continuous hard efforts, her positive and inspirational attitude and teaching approach within her role leading our Team programme in Lowestoft. Stacey is always full of enthusiasm and is willing to share ideas and offer help to other members of staff sharing teaching ideas and resources which really shows her commitment. She always has the charity at the forefront of all that she does. She has a brilliant rapport with her team participants and supports them above and beyond to complete the programme, fulfil their potential and help them succeed in the future. Congratulations to Chris Scopes and Alex Tricker who were also recognised for this award. This award recognises a dedication in keeping the charity at the forefront of everything they do. Our nominees go out of their way both to support others and to continually perform above and beyond their role. The Extra Mile ward went to Sarah Rowe for her enthusiastic dedication to charity events. Sarah has always gone above and beyond her job role to further the charity and support her colleagues. She continues to offer support and guidance to everyone that works at the charity. She is always keen and enthusiastic to hear about your ideas and how she can help you develop them even further. She always gets involved with different charity events including the Twilight Run and quizzes and is really keen to support the charity in any way she can. She has helped her fellow staff out when needed, including hosting mock interviews for our Prince’s Trust Team Programme. Sarah has really proven her dedication to the charity and has truly done the extra mile. Well done to Ashleigh Hurrell and Niall Woods for their fantastic work and dedication which was recognised by being shortlisted! We are so pleased with the success of our first ever Inspire Suffolk student and staff awards and look forward to hosting many more and continuing to celebrate the amazing journeys made by our young people and hard work and dedication of our team of staff. Find out more about our work and how you can support us here.